Our exclusive 50 key rolling key case design is easy to use, durable and lightweight. Key storage has never been so simple! Keep your dealership keys organized and securely stored on the go. Our rollable key case is perfect for repair centers, car dealerships, real estate agents, apartment managers and more. Numbered clearly for easy organization and material that is rugged and will stand up to normal wear and tear without issue. Are you looking for a key storage solution? We have the answer with our rolling key storage and best of all BER Flags and Bowz, Inc guarantees to best prices available. With a capacity of 50 keys this case is your answer to key confusion! If you are a real estate agent on the go managing multiple listings, a repair shop manager looking for a convenient way to track your customer keys, or overseeing a large dealership our portable, roll-able and compact key storage is the answer! 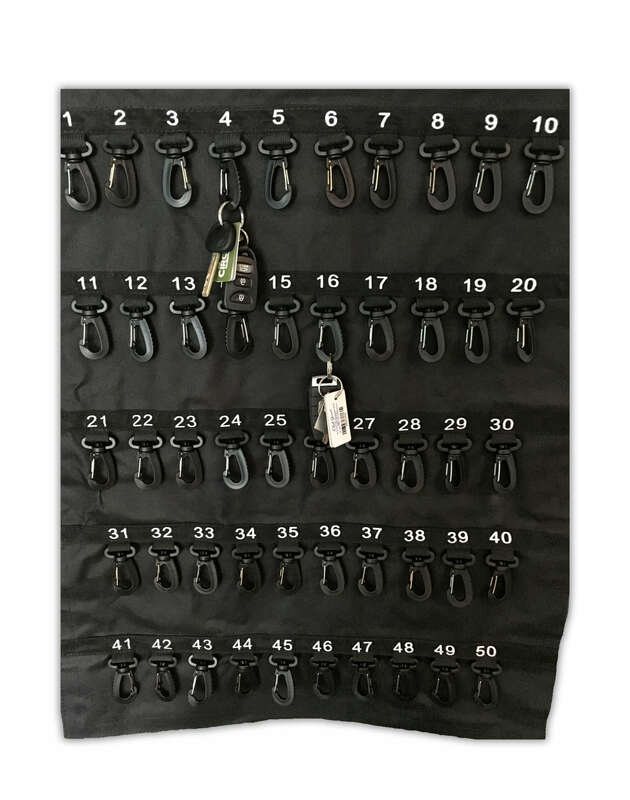 50 key capacity Portable key storage solutions for all your keys! Available in 30 key or 50 key sizes. Quantity discounts available! Email orders@carbowz.com for more info. You may be interested in some of our other products – round corner key tags, custom flags, or jumbow car bows! BER FLAGS AND BOWZ / CarBowz is a distinguished distributor of promotional and event products, covering a wide variety of promotional needs in any venue. Vendors, realtors, businesses and events have consistently chosen CarBowz to fill their marketing needs due to our well established roots. Choose from a wide variety of bows, banners, flags, reusable balloon clusters, and much more to draw attention to events or businesses anywhere. We are here to help!